It's widely known to those of us who frequent forums that scooterists are a unique bunch and want to have an identity all our own. For many of us, part of this means not looking like a motorcyclist wannabe when we gear up for our ride. However, the options for those of us who want to wear good quality riding gear without suiting up in a "Power Ranger" jacket festooned with logos and graphics have been limited to the few less-embellished offerings from the major motorcycle gear companies and one scooter-centric gear company, Corazzo. 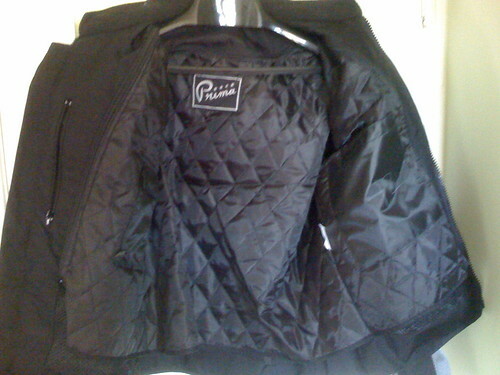 The Pullman jacket ($125) is the first release by Prima, a division of Genuine/Scooterworks that also makes accessories, in what promises to be an interesting new line of protective apparel. I've had one for about a week, and wore it for 10 continuous hours yesterday during a long group ride. 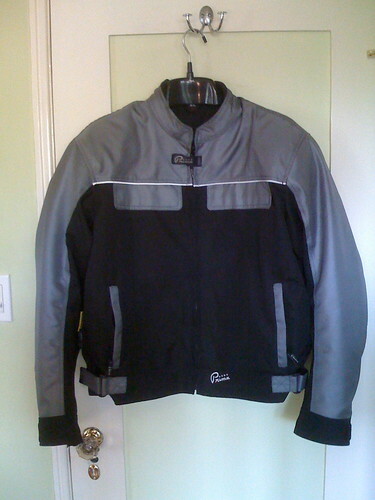 As a basis for comparison, I've owned four other riding jackets: a Joe Rocket (since retired), a Corazzo Max (which replaced the Joe Rocket), and two Belstaffs (great jackets, no armor). I was immediately impressed by the quality of the materials and construction, the numerous features and attention to detail. The exterior is a heavy, 600 Denier nylon, with what feels like a waterproofing layer underneath and a mesh lining. The Pullman also features a zip-out full quilted liner, an unusual feature in this price range. There are numerous pockets�two outside chest, two side and one inside chest. 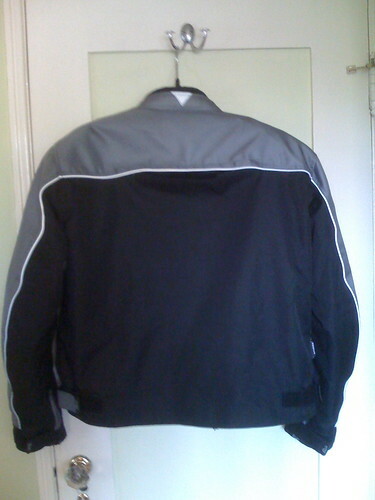 The jacket also has velcro straps to adjust the waist and cuffs and zippered sleeves. One of my favorite details is the rubber tabs on the velcro straps which makes them very easy to grab with gloves on. Rounding out the features is reflective piping across the chest and along the arms. I've learned to really appreciate the piping on my Corazzo; it's very effective at night. I'm glad to see this on the Pullman as well. My one concern was the lack of venting. There's just one zippered vent across the top of the back. Aesthetically, the Pullman is somewhat fashion-neutral, with an emphasis on practicality and simplicity. It's like a basic pair of Levi's in that it will appeal to many different people, with different results depending on their personal style. Prima boasts that, "[Our] vision was function and fashion. You no longer have to worry about looking like robocop in your riding gear when you walk into a restaurant!" While that's definitely the case, there's no hiding that this is a riding jacket. Its features (wrist closures, waist straps, heavy nylon) are visible and can't be denied. That said, this is a good-looking, casual jacket that doesn't scream "riding jacket." The fashion can't completely conceal this jacket's function. Most features are subtle and even the armor is well-integrated into the shape of the jacket so it doesn't bulge out too much. Though I expressed dislike for anything "festooned with logos," the Pullman has nine visible on the exterior. I'll forgive most of these (as on the zipper pulls), which are fairly subtle. Even the largest ones are small, but having two on the front of the jacket (on the rubber zipper tab on the chest and above the waist) is a minor excess. The Pullman seems to run a bit small. I normally wear a size 46 jacket and have XLs in my other gear. On first fit, the Pullman felt a bit snug in the shoulders and sleeves and it's somewhat short. (I have a slightly long torso, though.) I have the sense a XXL would be too big, though. While many riding jackets have a tapered shape, wide and roomy on the top and narrow at the waist, the Pullman is fairly straight in the shoulders, chest and sides. The adjustable waist is nice, though I hope to be able to make it tighter instead of looser over time. The fit improved the longer I wore the Pullman. By the end of the day, it hardly felt like I was wearing an armored jacket. The sleeves and shoulders seemed to relax as I broke it in and the fabric became less stiff. It's still a fairly snug fit, though. Without the liner, I can wear a sweater or track jacket under the Pullman. With the liner, maybe a light jacket underneath. If you frequently need to wear several layers, you may need to go up a size. That said, the quilted liner is pretty toasty and will serve you well in cool weather. Still, some riders may have some issues depending on their shape and dimensions so I highly recommend trying the jacket on before purchase if possible. The Pullman has a fairly short collar with a fleece lining. It felt fine zipped all the way up, not constricting. In cold weather, a rider would probably need a gaiter or scarf. I've ridden in the Pullman in temperatures ranging from the low 50s to the mid 80s, with high winds in some areas. The jacket breathes very well, without letting too much of the wind in. At about 50 degrees with the quilted liner in and a track jacket and t-shirt underneath, the Pullman was perfectly comfortable at 60mph. By the time the temperature rose to 60, I was warm and ditched the track jacket. Like all solid textile jackets, it starts to get pretty hot once temps reach the mid 80s. At that point, nothing short of a mesh jacket is comfortable for me. It's been that way with all 3 textiles I've owned, regardless of the amount of venting. Prima calls this a three-season jacket and that's on the money, though which three seasons may depend on the climate where you live. The Prima Pullman is like the Genuine Buddy of riding gear. It's not the flashiest jacket out there, will appeal to a broad range of buyers, and offers excellent quality and features for the price. The only drawback at this point is potential fit issues for some buyers, but that's probably the case with all riding gear. Best to try it on first if possible. If you're going to want to layer it for winter, you may want to go a size up. Updated with info on riding in lower & higher temps. Nice review! Do you have any suggestions for an all-mesh jacket for warmer temps? I'm worried this jacket, while it looks great, won't work when August rolls around. Though I wouldn't expect any less from from the head honcho. So I always wondered about the whole motorcycle jacket shaping deal... do they make the chest/shoulders areas so big for you to hold your arms up or something? I have yet to find an armored jacket that isn't huge in the upper torso and tight around the waist. The Pullman won't work for me either, probably 70% of the year is 80 degrees or above! Hi Abstraxion and welcome to ModBud! You're right, this jacket will likely not be great for the summer (I'm still really interested in it as a "winter" jacket though). There's a lot of talk about great mesh jackets here. Check out the search function up at the top right and search "mesh AND jacket" and make sure you've got the "search for all terms" button selected. There's also some fairly recent threads in the first couple of pages. I wear a Fieldsheer High Flow Mesh jacket that I love for a number of reasons including the amount of armor, the fit and adjustability, and the fact that it has textile slide patches in the most critical areas. Something a little lighter that people have been talking about is this Vanson Vent Max 3 mesh jacket that seems pretty cool. So I always wondered about the whole motorcycle jacket shaping deal... do they make the chest/shoulders areas so big for you to hold your arms up or something? I have yet to find an armored jacket that isn't huge in the upper torso and tight around the waist. It's to enhance the image of the Power Ranger physique. For what it's worth, I finally wrote my review. I also spotted someone sporting a prototype of a newer style the other day! I saw these in person at Motorsport last Saturday. Very nice. Me and the boy toy were quite impressed. I have this jacket. I got it right after buying my Roughhouse. It's my favorite jacket to wear now, especially thanks to Rochester's weather refusing to migrate out of the 40's and 50's for long, and definitely looks good. It doesn't look like a "RIDING JACKET!!" per se, but I did get many inquiring questions, "You ride a motorcycle, eh?" due to the body-shaping armor. Subtle yet handsome. My only complaint is that the forearm and elbow armor seem to be too loose, and gyrate around my arms easily when I have the inner lining out. With the inner lining in place, they're secure. I worry about them not being in place upon sliding. Anyone know a solution to this? Straps that I can install? I saw a prototype of an earlier style that was very cool�had racing stripes down the front. Kind of wish they'd done one like that! The back vent doesn't help at all if you wear a backpack or even carry a messenger bag. 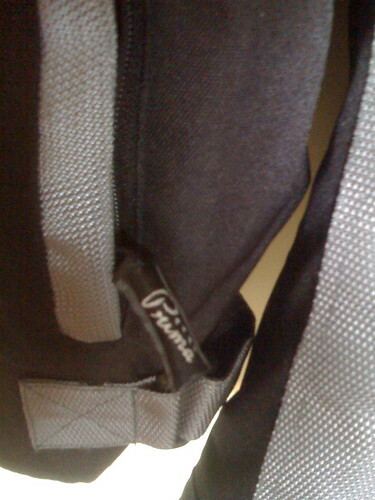 I had the same problem with the Corazzo armpit vents�a backpack renders them useless. My 2c on this coat. I was a bit skeptical at the recommendation to go a size bigger, so I didn't. I am glad I didn't the coat fits perfectly. It is a fitted coat so I can see why many might want to go bigger initially. I am glad Scooterworks put some measurements up, I was able to compare measurements to my existing riding coat. For the current sale price of $104.99 it was a great deal IMO.